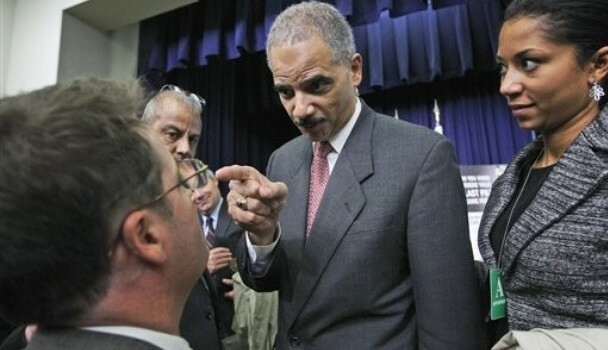 Embattled Attorney General Eric Holder today demanded The Daily Caller stop publishing articles about the growing calls in Congress for his resignation because of the failed Operation Fast and Furious gun-walking program. As Holder’s aide was escorting the attorney general offstage following his remarks Tuesday afternoon at the White House, a Daily Caller reporter introduced himself and shook Holder’s hand. The reporter asked him for a response to the growing chorus of federal legislators demanding his resignation. The Obama administration takes the position, apparently, that the public and Congress have no legitimate interest in a federal program that deliberately equipped Mexican drug dealers with thousands of weapons and led to the deaths of an American border patrol agent and hundreds of Mexicans. Consistent with that view, it has sealed court records relating to the murder of border agent Brian Terry. The Obama administration gives the impression that it increasingly regards democracy as an inconvenience.